Roulette is a favourite game for storytellers. The randomness and prolonged suspense of each turn of the wheel appeal to literary themes of uncertainty, risk, and fate. Russian novelists Leo Tolstoy and Fyodor Dostoevsky were both passionate about roulette, and on separate occasions summoned Ivan Turgenev to German casinos to help pull them away from games. Fyodor Dostoevsky, The Gambler (1866) – Legendary Russian novelist Dostoevsky had to finish this story in a hurry – to pay off his own casino debts. The story involves indebtedness to others and features numerous casino scenes at the roulette table. Daniel Deronda by George Eliot (1876) – The story of Daniel Deronda and Gwendolen Harleth starts with Ms. Harleth losing all of her money at the roulette table. She pawns a necklace to gamble further, but Deronda buys it back and has it returned to her. 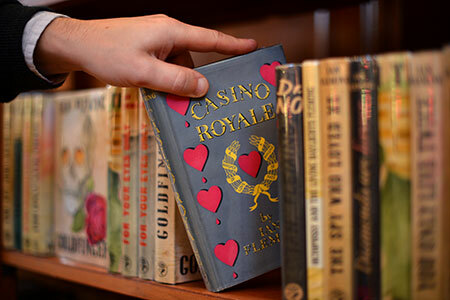 Casino Royale by Ian Fleming (1953) – The first James Bond novel opens with Bond playing roulette. The roulette table is a frequent setting in the Bond novels, and enthusiasts of the game have even developed a 'James Bond system' based on the fictional superspy's strategy. The Eudaemonic Pie by Thomas Bass (1985) – Non-fiction story of a group of graduate students who built toe-activated computers to predict the results of casino roulette games. 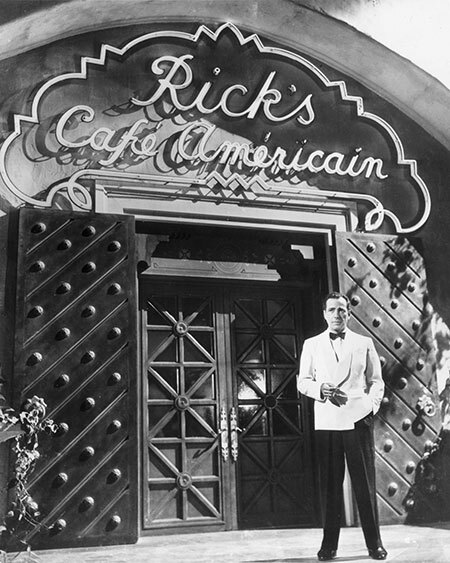 Casablanca (1942) – Most of the film is set in Rick's Café Américain, which has a rigged roulette wheel to benefit the proprietor (Rick, played by Humphrey Bogart). Rick tells a newlywed husband, trying to get money for visas to get to America and escape the war, to bet number 22 on the roulette wheel. He does and wins. To Catch a Thief (1955) – Alfred Hitchcock film starring Cary Grant and Grace Kelly, set at villas, casinos, and hotels of the French Riviera. Grant plays John Robie, a former jewel thief hired to follow Frances Stevens (Kelly), on suspicion that she is currently a jewel thief. In one casino scene, Robie (Grant) drops an expensive chip down the décolletage of a female roulette player. The Sting (1973) – One of the most famous movies about games of skill and luck, as well as confidence games ('cons'). 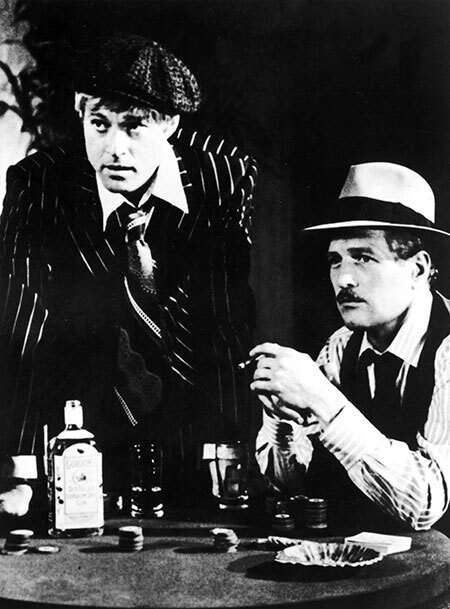 Starred Paul Newman and Robert Redford as dishonest players trying to win money from even more dishonest players. Featured a scene in which Robert Redford's character loses his previously-stolen profits on a fixed roulette wheel. Lost in America (1985) – The comedy finds Albert Brooks and Julie Hagerty as a husband and wife ready to leave their fast-paced lives behind. Just a few days into their new lifestyle of driving a Winnebago cross-country, they stop in Las Vegas and the wife loses all their money at roulette. She bets 22 but, unlike the husband and wife in Casablanca, never wins. Toy Story 3 (2010) – The popular Disney Pixar film features a scene in which the animated toys establish a casino. A See 'n Say toy is used as a roulette wheel. The stakes are batteries. Roulette has been popular for hundreds of years. The period it takes the spinning ball to rest on a number extends the period of suspense and contemplation. Those two time spans – hundreds of years, the time it takes to resolve a bet – have been filled with 'systems' for beating roulette. The strategies are different mathematical models of determining bet size. These systems are actually just different ways to bet on already-fixed odds. Each casino establishes those odds, and some players use a preferred betting method to feel as if they are outplaying the system. In each instance, the systems maximize wins and minimize losses under certain circumstances, and do the opposite in other circumstances. Martingale - Double an initial bet after losing. After every loss, double the bet again until the win makes up for all of the losses. It is designed for betting red-black, high-low, and even-odd. Grand Martingale - Similar to the martingale but is enhanced by adding one unit to each bet following a loss. Continue until one win makes up for all the losses plus makes a one-unit profit. Labouchere - Using a preset series of numbers, a player assigns a betting amount to each number. Play the outside numbers in the list first and multiply the betting amount by six. Upon winning, cross those numbers off and use the remaining outside numbers. But upon losing, add a number to the end of the series and start over. D'Alambert - A variation of the original Martingale system, a player increases the betting by one unit for each lost bet. Paroli - This system is the opposite of Martingale, doubling bets after a winning spin. Joseph Jaggers (1873) - An English engineer started with small stakes at the Monte Carlo roulette wheel and won between 150,000 and 300,000 francs on the first day. After three days, he had won 1.5 million francs. His system prompted croupiers to begin spinning the ball in the opposite direction of the wheel spin. Charles Wells (1891) – During a three-day winning streak at Casino de Monte Carlo, he won 1 million francs and temporarily closed several roulette tables by cleaning out their 'bank'. He immediately became an international celebrity and was immortalised in the song, The Man That Broke the Bank at Monte Carlo. He returned for a second profitable run in roulette. In January 1892, he returned a third time on a 291-foot yacht, and lost heavily, including some money he received for people who thought they were investing in a device to burn coal more efficiency. He was later imprisoned for eight years in the UK for the fraud. Gonzalo Garcia-Pelayo (1989) - The Spanish mathematician studied the roulette wheels at Casino Gran Madrid for imperfections and designed a strategy accordingly. After being banned from casinos, he sued and won. Spain's Supreme Court declared his methods 'correct' and 'ingenuous'. Chris Boyd (1994) - An English computer programmer sold his house for £147,000 and took it to Binion's Horseshoe in Las Vegas. He bet it all on red, doubled his money, and flew back home to his girlfriend in High Wycombe, who was unaware of his plan. Ashley Revell (2004) - In an attempt to recreate Boyd's success, the Englishman sold his home, flew to visit The Plaza in Las Vegas, and bet £76,500 on red. The wheel stopped on the red seven, the exact number hit by Boyd, and he doubled his money. He then flew back to Kent to resume his life. In 1873, English engineer Joseph Jaggers started with small stakes at the Monte Carlo roulette wheel and won between 150,000 and 300,000 francs on the first day. After three days, he had won 1.5 million francs. His system prompted croupiers to begin spinning the ball in the opposite direction of the wheel spin. In 1989, Spanish mathematician Gonzalo Garcia-Pelayo extensively studied the number patterns on roulette wheels at Casino Gran Madrid for imperfections and designed a strategy accordingly. He first won £350,000 in one day and more than £700,000 between 1992 and 1994. After being banned from casinos, he sued and won. Spain's Supreme Court declared his methods 'correct' and 'ingenuous'. Charles Wells (1891) – In 1891, inventor Charles Wells became a world-famous casino player at Casino de Monte Carlo. During a three-day winning streak, he won 1 million francs and temporarily closed several roulette tables by cleaning out their 'bank'. He immediately became an international celebrity and was immortalised in the song, The Man That Broke the Bank at Monte Carlo. He returned for a second profitable run in roulette. In January 1892, he returned a third time on a 291-foot yacht, and lost heavily, including some money he received for people who thought they were investing in a device to burn coal more efficiency. He was later imprisoned for eight years in the UK for the fraud. In 1994, English computer programmer Chris Boyd sold his house for £147,000 and took it to Binion's Horseshoe in Las Vegas, Nevada, USA. He bet it all on red, doubled his money when the wheel landed on red seven, and flew back home to his girlfriend in High Wycombe, who was unaware of his plan. Ashley Revell knew of Chris Boyd's feat. In 2004, Revell sold his home and possessions and flew to Las Vegas. He arrived at The Plaza downtown wearing a rented tuxedo, having sold all his clothes. He bet it all - £76,500 - on red. The wheel stopped on the red seven, the exact number hit by Boyd, and he doubled his money. He, too, simply collected his winnings and returned to England to resume his life. Sean Connery is known for his illustrious acting career, especially for his portrayal of James Bond. Shortly after his first Bond role in 1962, he visited Casino de la Vallee in Saint-Vincent, Italy. He bet twice on number 17 and lost. He then place a third bet on 17 and hit for a substantial payout. He let those winnings ride on 17 and hit again, and even a third time. He walked away with £10,750 in winnings. In 1971, in Connery's sixth Bond film, Diamonds are Forever, James Bond plays roulette in Las Vegas and bets 17. The most successful casino of the 19th century was Francois Blanc's Casino de Monte Carlo. He brought to Monte Carlo the innovation he developed with his brother in Bad Homburg to offer a roulette wheel with only a single zero. Blanc was known as the 'Magician of Monte Carlo' and the legend started that he made a deal with the devil to obtain his casino's success at roulette. The 'evidence' for this myth was that the sum of the numbers on the roulette wheel add up to 666.